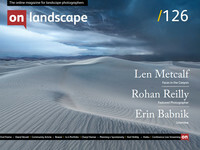 In two weeks time our landscape photography conference begins and we are very proud to be bringing Erin Babnik over from the US to talk. Erin's work has an intriguing balance of the classic sublime but without the level of bombast that this sub-genre of landscape typically engenders. We asked Erin a few questions about her photography and background. If you like what you read, please come and see her talk titled "Life Lessons for Creative Expression" on Sunday at the Meeting of Minds conference (or watch it via live streaming!). You entered photography via a fairly unusual route, documenting archaeological digs while completing a history of art dissertation. Does your history of art background affect your approach to photography and can you pick three artworks that were and/or are still influences in your creative work? Although I was photographing while participating in archaeological digs, it was always someone else who had the job of documenting those excavations, and the photographs that I made were for my own research and teaching archive. What I needed was a collection of images that communicated whatever I found important about particular artifacts or architectural remains, and I traveled widely to archaeological sites and museums to produce that collection. For example, because my specialty was ancient Greek sculpture, I often needed angles of statues and certain lighting for them that helped me to explain my own interpretations of the artworks. Likewise, with photographing archaeological sites, I typically wanted to convey the context and display conditions of sculptures so that I could explain how these settings might have affected artistic decisions and viewer reception. So documentation per se was never really the name of the game for me.